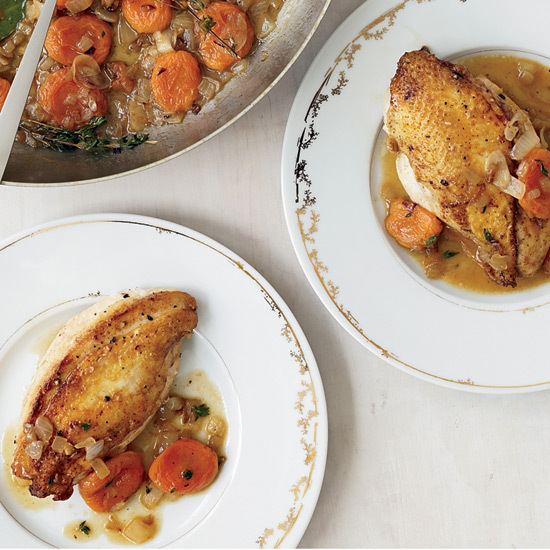 These delicious eco-friendly recipes include skillet-charred cherry tomatoes with basil and chicken breasts with apricot-onion pan sauce. 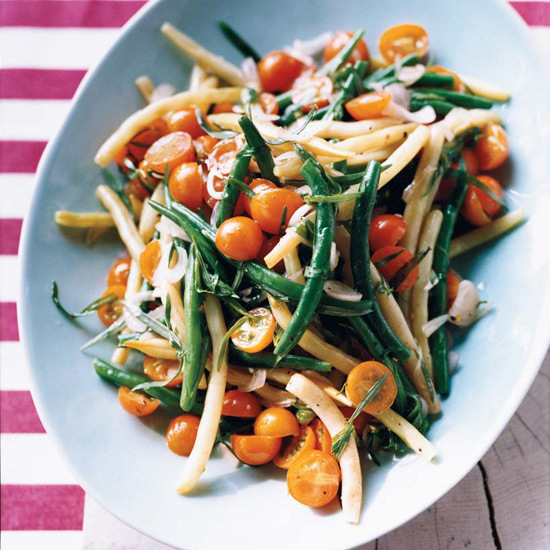 This supersimple bean-and-tomato salad, tossed with a tarragon-flavored dressing, is perfect for picnics, like the kind Paul Virant’s mother would prepare when he was a child. "She would make tomato salad, potato salad and fried chicken the night before, so we’d have everything ready the next day," he says. 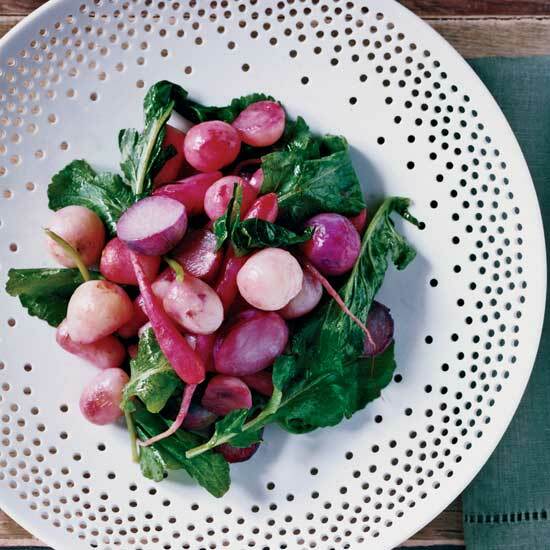 Gerard Craft came up with this clever recipe one year when his local farmer had an abundance of radishes. Craft tried roasting them. The result: warm, crisp-tender radishes with delightfully bitter greens, which he finishes with butter and lemon. 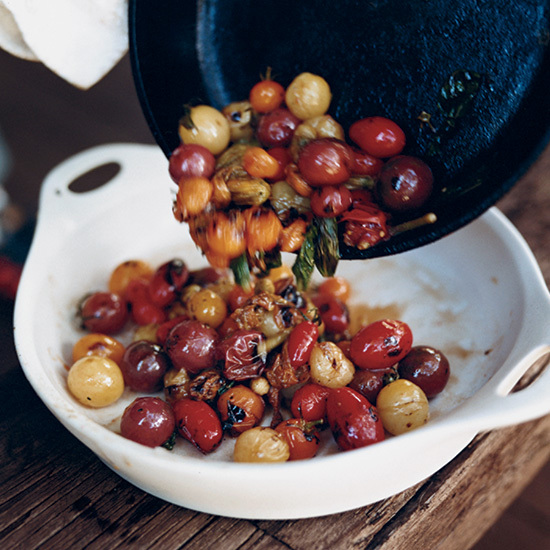 Chris Cosentino remembers charring tomatoes when he was a line cook under chef Mark Miller at Red Sage in Washington, DC. "Mark always said, 'It needs fleck,'" Cosentino says, referring to the blackened bits on the skins. "The fire brings out the sweetness in the tomatoes." 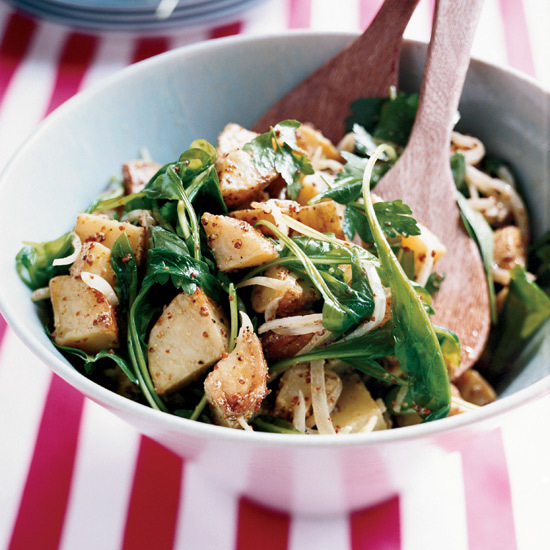 Paul Virant puts a spin on the classic side dish by tossing warm potatoes with a mustardy vinaigrette and handfuls of arugula. "I grow a lot of arugula in my garden," he says. "It’s so easy to grow, it’s a joke. A farmer once said to me that if everyone who had enough space planted a garden, we could produce enough food to feed the entire country. I don’t know how that would work, but it’s fun to think about." At Cavallo Point, cooking school director Kelsie Kerr teaches the basics of preparing seasonal recipes. 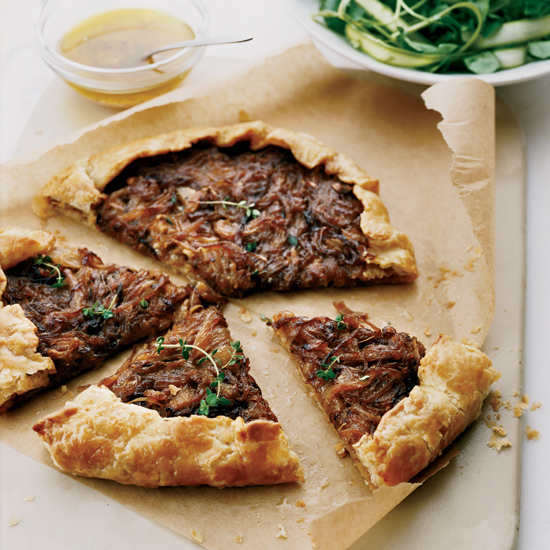 The buttery dough for her savory onion tart, for instance, is great with all kinds of fillings, like fruit. Takashi Yagihashi glazes chicken legs in a mustard sauce; on the side are buttery bok choy and a generously dressed salad. 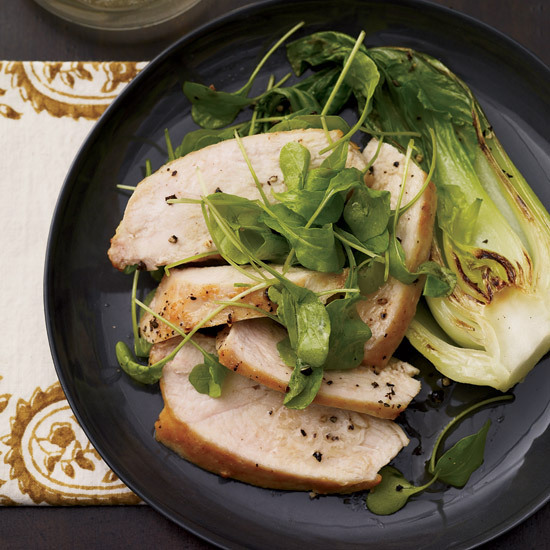 In the healthier way, opt for chicken breasts instead of legs, cook the bok choy in a minimal amount of oil (no butter) and dress the salad lightly with oil, soy sauce and rice wine vinegar. 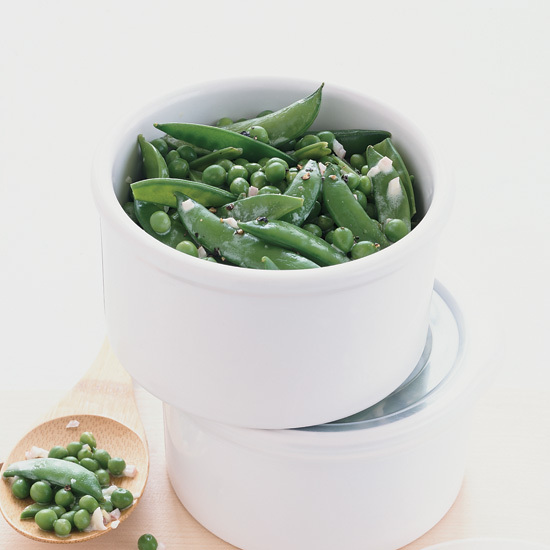 This combination of sugar snap peas, snow peas and green peas—dressed in a sherry vinaigrette blended with a touch of sour cream—is clever and delicious. 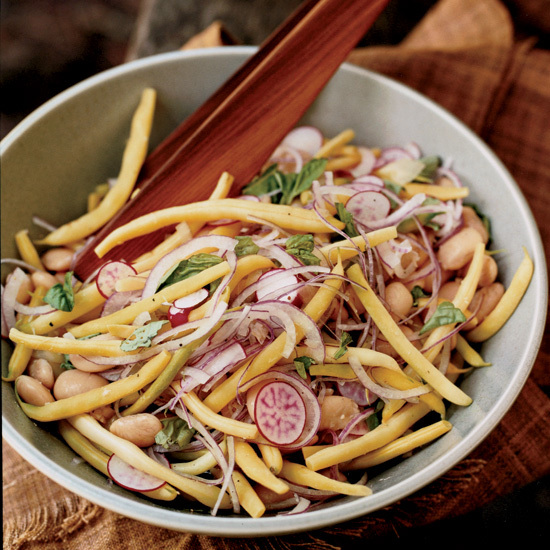 For a crunchy salad, Chris Cosentino tosses yellow wax beans, radish slivers, red onion slices, cannellini beans and fresh basil in a simple vinaigrette. To save time, you can also substitute canned cannellinis for the dried ones here.